Sushi Zento – One of the latest addition to the Japanese cuisine scene in Ipoh; making up the number to almost a dozen now within the same area. 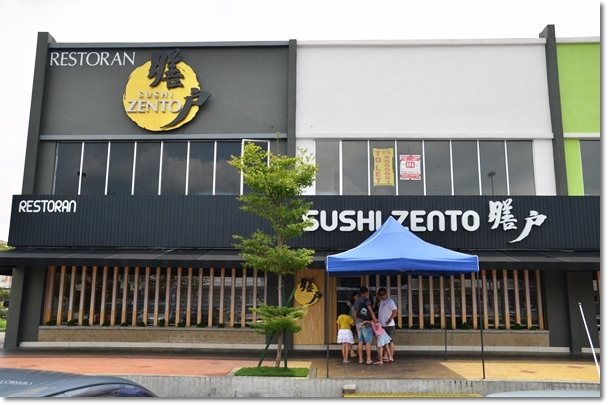 Sushi Zento hails from the same Edo Ichi group of Japanese restaurants; with outlets in Klang Valley, Penang, Sabah and now Perak. Other famous names include Azuma (read the dining experience at Queensbay Mall), Sushi Zento in Penang and now Ipoh, as well as Hana in Kota Kinabalu, Sabah. The sudden surge in number of Japanese restaurants in Ipoh; particularly around the Medan Ipoh Bestari area (near to Jusco/Tesco of Ipoh Garden East) had initially gathered steam and generated raving interests for freshly-flown in sashimi, premium grade beef and fusion sushi rolls. However, after awhile, the restaurants started to mimic one another with no clear differentiation and started charging premium prices for lackadaisical Japanese fares. 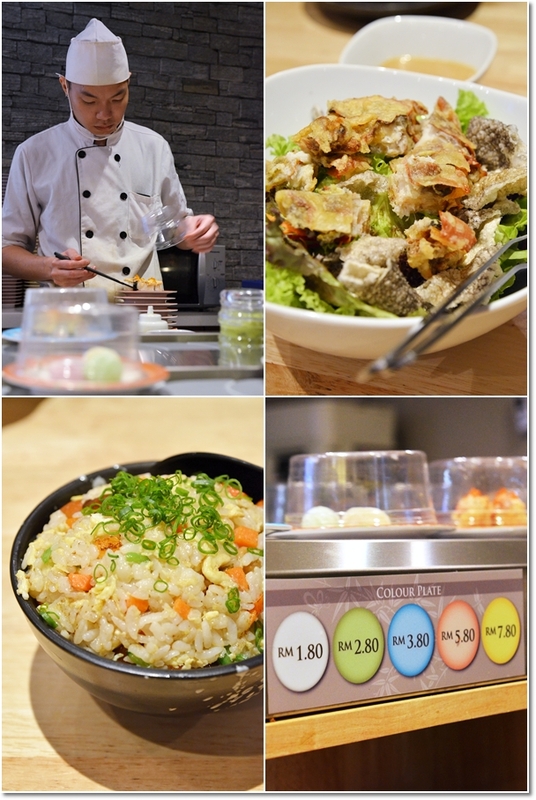 Then I caught raving reviews of Sushi Zento @ Festival Walk, Ipoh; the row of colourful new shops near to Kizuna/Akamomiji. Still hesitant after several disappointing outings to the various ‘new’ Japanese outlets in town, I put aside the thought of visiting. I first saw Sushi Zento in Penang; merely waving this branch in Ipoh off as another chain of Japanese restaurants out to make a quick kill of the undying love for anything Japanese amongst the Ipoh folks. 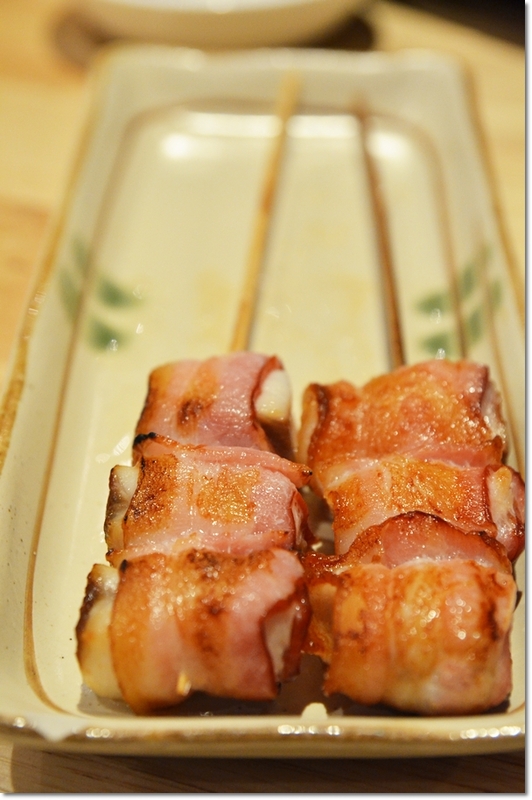 (Think Oh Sushi and you’ll go OMG ….). But a friend of mine (who’s from Penang herself) highly recommended this place albeit a fair warning of the slightly higher prices. And what better way to calm the frayed nerves, volatile mood and burning spirits (you know what today means to the Malaysians, right?) than a Japanese feast in an air-conditioned restaurant that opens from brunch hour onwards (11.30am)? 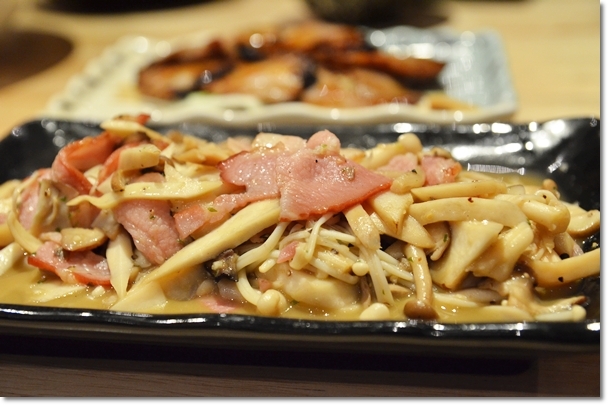 Kinoko To Bacon Butter Itame (RM16/USD5) – Smoky slices of pork bacon and a myriad of mushrooms stir-fried with butter. Heavenly. The moment I flipped the menu, the first page caught my attention. 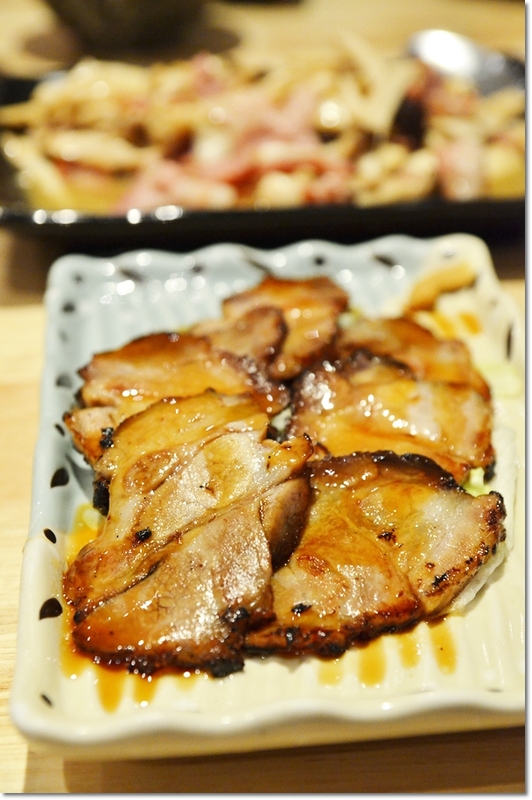 And then there’s also Bershire pork/black pig on the menu (kuro buta) but be prepared to fork out slightly more. On a side note, if you dig premium quality pork, try Singapore or Bangkok whereby you can find more outlets serving the pork at pretty reasonable prices, especially in Bangkok. 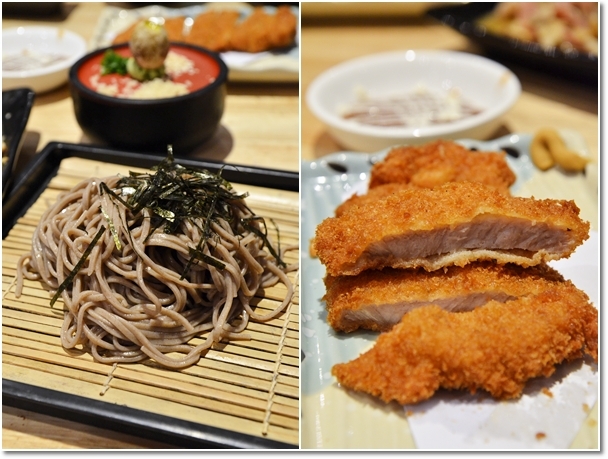 Rosu Katsu Zaru Soba (RM22/USD7) – Cold buckwheat noodles (you can also choose green tea version) served with breaded pork loin. And so we went a little crazy on the pork. Four dishes featured pork predominantly; and glad to say all of them fared above average. The slices of roasted pork belly (Cha Shu) were delicious; lightly drizzled in a sweet/savoury gravy, while the stir-fried mushrooms with bacon in butter would go down well with copious amount of rice. The breaded pork loin (rosu katsu) was good but let’s not compare to the katsu specialists in Singapore; in terms of quality and price. The accompanying cold soba was forgettable though; so you can omit the noodles and order the ala carte version at RM4 less. 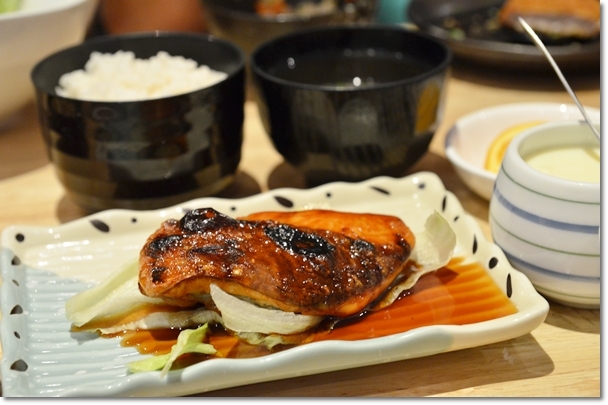 Shake Teriyaki Set (RM28/USD9) – Salmon teriyaki set with rice, miso soup, steamed egg custard (chawan mushi), salad and orange. 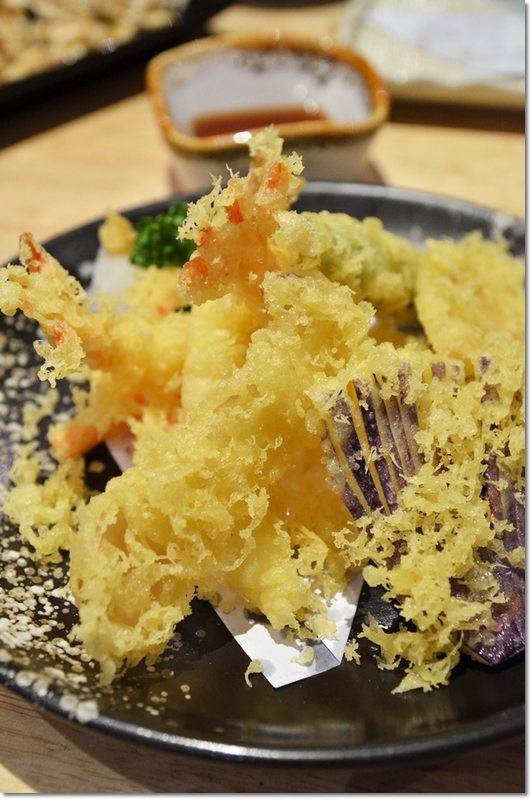 Capping off the meal with more cooked items, the mixed tempura came with 3 prawns, fish cutlets and vegetables, and the salmon teriyaki set was pleasant as well; the chunk of salmon grilled to a crisp on the skin and flaky, moist flesh within. The lunch sets at Zento are priced quite reasonably; with several sets below RM30/USD10 each, and more premium ones at around RM40-RM60 each. Needless to say, the meal at Zento did not fail to impress; both in terms of quality of food, promptness of service and comfortable dining environment. The selection of Japanese fares on the menu are not mere pushovers either; beyond the now becoming predictable caterpillar rolls and such. Three premises that can accommodate a fairly large crowd, yet do remember to make your reservations especially over weekends and public holidays. They have very interesting (and pricey) off-menu specials too; from live Boston lobster sashimi and hotpot (RM240/USD80 per portion) and blue fin tuna sashimi/sushi (hon otoro) to various fresh premium seafood; mejina (largescale black fish), aji (horse mackerel), renkodai (golden sea bream), amberjack belly, yellowtail belly, akagai (live ark shell) and uni (sea urchin) served whole or halved. 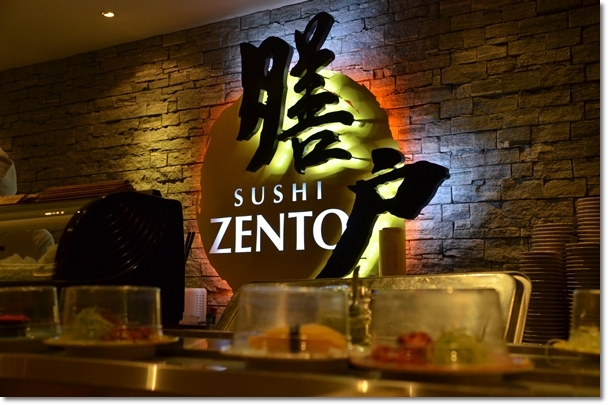 Will I return for another round of Japanese feast at Zento? Definitely. *The meal for 3 came to RM154/USD51. For now, let’s tune in for the next few hours (mainstream and definitely alternative media alike) to see how the future of Malaysia (at least for the next 5 years) will shape out to be. Never been to this one but Edo Ichi is pretty good as there are some creative dishes that I like there… I wouldnt mind trying this when I head back to Pg! Their onzen eggs taste so good, especially thick, gooey egg yolk is impressive.